a. (U) USNORTHCOM has been assigned the Force Protection (FP) mission and AT Program responsibility for the USNORTHCOM AOR. The purpose of the FP mission is to defend, detect, and mitigate against terrorist attacks directed at DoD personnel, infrastructure, resources, and information to ensure DoD’s continued warfighting capability. The scope of this mission extends to all DoD Elements and personnel in the USNORTHCOM AOR, whether assigned or unassigned to USNORTHCOM. While the FP mission supports USNORTHCOM’s primary missions of Homeland Defense (HLD) and Civil Support (CS), it is a separate task assigned in the Unified Command Plan (UCP) (ref. a.) and is executed through a different chain of command from the specified USNORTHCOM missions of HLD and CS. The successful execution of the USNORTHCOM FP mission enables the USNORTHCOM HLD and CS missions, and assures availability of DoD assets in support of other Combatant Command-assigned missions. b. (U) Area of Concern. (1) (U) Area of Responsibility (AOR). (a) (U) USNORTHCOM’s geographic AOR for the conduct of normal operations, contingency planning, security cooperation, and force protection is the 48 contiguous States and the District of Columbia, Alaska, Canada, Mexico, the Gulf of Mexico, the Caribbean Sea and its island nations and European possessions (including the Commonwealth of Puerto Rico, the U.S. and British Virgin Islands, Turks and Caicos Islands and Bermuda), and the Atlantic Ocean and its island nations and European possessions (excluding Greenland) within the area bounded by the Arctic Ocean from 169 degrees W east to 045 degrees W, south to 20 degrees N, west to 064 degrees W, south to 17 degrees N, west to 068 degrees W, north to 21 degrees N, west to 073 degrees W, southwest to 19 degrees N, 075 degrees W, west to 079 degrees W, north to 20 degrees N, west to Mexico, south from Mexico at 092 degrees W to 08 degrees N, west to 112 degrees W, northwest to 50 degrees N, 142 degrees W, west to 179 degrees W, northeast to 63 degrees N, 173 degrees W, northeast to 64 degrees N, 169 degrees W, and north to 90 degrees N. U.S. Southern Command (USSOUTHCOM) provides contingency planning, operations, security cooperation, and force protection for the Bahamas and Cuba, and their territorial waters (ref. a.). (b) (U) As addressed in this order, the CONUS portion of the USNORTHCOM AOR comprises the contiguous 48 States, the District of Columbia and Alaska. The OCONUS portion of the USNORTHCOM AOR comprises the Commonwealth of Puerto Rico, Canada, Mexico, Bermuda, the U.S. and British Virgin Islands, Turks and Caicos Islands, and St. Pierre and Miquelon Islands. (c) (U) Within the USNORTHCOM AOR two Joint Operations Areas (JOA) have been established: Alaska and the National Capital Region (NCR). 1. (U) The Alaska JOA comprises the landmass of the State of Alaska. (2) (U) Area of Interest. USNORTHCOM’s area of interest includes the entire globe, as operations throughout the world that require U.S. infrastructure, C4ISR and power projection capabilities that reside in USNORTHCOM’s AOR. USNORTHCOM will request support from other Combatant Commanders, Services and Agencies, when a threat is detected in the USNORTHCOM AOR. USNORTHCOM must also establish and maintain meaningful and effective bi-lateral or multi-lateral security relationships with countries in USNORTHCOM’s AOR to coordinate security and defense issues of mutual concern. As necessary, our regional partners will track the HLD threat, share threat information and intelligence, and facilitate threat engagement by USNORTHCOM (S) USNORTHCOM CONPLAN 2002 Homeland Defense (Draft) (U). a. (U) Within CONUS, USNORTHCOM’s Area of Interest extends to those critical non-DoD events and infrastructure that may impact DoD operational capabilities or require DoD support for protection or incident management support. c. (U) Deterrent Options. N/A. d. (U) Enemy Forces. Annex B, Intelligence. USNORTHCOM faces a wide range of potential threats in executing its command responsibilities. These threats range from strategic and regional threats posed by nation states to threats from transnational and indigenous terrorist groups and criminal activities subject to federal law, regulation, and the Posse Comitatus Act. USNORTHCOM is responsible for protecting against the full range of threats to DoD assets within the USNORTHCOM AOR. e. (U) Friendly Forces. Annex A, Task Organization. (1) (U) USNORTHCOM Mission. USNORTHCOM conducts operations to deter, prevent and defeat threats and aggression aimed at the United States, its territories and interests within the assigned AOR. As directed by the President of the United States (POTUS) or Secretary of Defense (SECDEF), USNORTHCOM provides military assistance to civil authorities, including incident management operations. (a) (U) The Secretary of Defense (SecDef). (b) (U) The Assistant Secretary of Defense for Special Operations and Low Intensity Conflict (ASD (SO/LIC)). (c) (U) The Assistant Secretary of Defense for Homeland Defense (ASD(HD)). (d) (U) The Assistant Secretary of Defense for Health Affairs (ASD (HA)). (e) (U) The Joint Staff J3 Deputy Director for Anti-Terrorism and Homeland Defense (DDAT/HD). (3) (U) All DoD assets (assigned and unassigned) in the USNORTHCOM AOR are included in the FP mission execution. (4) (U) In addition to DoD forces, USNORTHCOM coordinates within the Interagency to accomplish the FP mission. (a) (U) Department of Homeland Security (DHS). (b) (U) Department of State (DoS). Chiefs of Mission (COM) and for intelligence support. (c) (U) Central Intelligence Agency (CIA). (d) (U) U.S. Secret Service (USSS). (e) (U) Other Primary Agencies (PA) for Special Security Events (SSE) and National Special Security Events (NSSE). (1) (U) Posse Comitatus. The Posse Comitatus Act (PCA) places limitations on military support to civilian law enforcement. The PCA is a criminal statute and violators are subject to fine and/or imprisonment. Prohibiting direct military involvement in law enforcement is in keeping with long-standing U.S. law and policy limiting the military’s role in domestic affairs. However, there are statutory exceptions to the PCA’s prohibitions and the statute does not limit the President’s constitutional power to direct actions that might otherwise be prohibited by the PCA. For instance, the protection of DoD personnel, DoD equipment, classified military information or equipment, and official guests of the DoD, and such other actions that are undertaken primarily for a military or foreign affair’s purpose are not prohibited. The PCA generally prohibits federal military personnel from interdicting vehicles, vessels and aircraft; conducting surveillance, searches, pursuit and seizures; or making arrests on behalf of civilian law enforcement authorities. The PCA applies to the federal uniformed services within DoD (Army, Air Force, Navy, Marines). It does not apply to the U.S. Coast Guard under Title 14, or the National Guard in State Active Duty and Title 32 status or to Title 5. (2) (U) Intelligence Oversight. In accordance with Executive Order 12333, the DoD has established procedures in DoDD 5240.1 and DoD 5240.1-R for the collection, retention, and dissemination of information concerning U.S. persons. DoDD 5240.1 and DoD 5240.1-R apply to all DoD intelligence components and activities. The purpose of the procedures specified in DoD 5240.1-R is to enable DoD intelligence components to effectively carry out their authorized functions while ensuring that the privacy and other rights of U.S. persons are respected. (2) (U) Command Headquarters Locations. (a) (U) USNORTHCOM. Peterson AFB, Colorado Springs, CO.
(b) (U) Headquarters, Department of the Army. Pentagon, Washington, DC. (c) (U) Headquarters, Department of the Air Force. Pentagon, Washington, DC. (d) (U) Headquarters, Department of the Navy. Pentagon, Washington, DC. (e) (U) Headquarters, U.S. Marine Corps. Washington, DC. (f) (U) JTF-AK. Elmendorf AFB, AK. (g) (U) JTF-CS. Fort Monroe, VA.
(h) (U) JTF-North. Fort Bliss, TX. (i) (U) Defense Logistics Agency (DLA). Fort Belvoir, VA.
(j) (U) Defense Threat Reduction Agency (DTRA). Fort Belvoir, VA.
(k) (U) Defense Security Service (DSS). Alexandria, VA.
(l) (U) Defense Commissary Agency (DeCA). Fort Lee, VA.
(m)(U) Defense Contract Management Agency (DCMA). Alexandria, VA.
(n) (U) Defense Intelligence Agency (DIA). Bolling AFB, DC. (o) (U) National Geo-Spatial Intelligence Agency (NGA). Bethesda, MD. (p) (U) TRICARE Management Activity (TMA). Falls Church, VA.
(q) (U) Defense Contract Audit Agency (DCAA). Fort Belvoir, VA.
(r) (U) Defense Human Resources Activity (DHRA). Arlington, VA.
(s) (U) Defense Finance and Accounting Service (DFAS). Arlington, VA.
(t) (U) DoD Counterintelligence Field Activity (CIFA). Arlington, VA.
(u) (U) Defense Information Systems Agency (DISA). Arlington, VA.
(v) (U) DoD Education Activity (DoDEA). Arlington, VA.
(w) (U) National Security Agency (NSA). Fort Meade, MD. (x) (U) Army & Air Force Exchange Service (AAFES). Dallas, TX. (y) (U) Missile Defense Agency (MDA). Arlington, VA.
(z) (U) Pentagon Force Protection Agency (PFPA). Pentagon, Washington, DC. b. (U) Command, Control, Communications and Computer (C4) Systems. (1) (U) The AT information architecture will be an evolving process. Hence, AT information procedures will require modification as AT information capabilities improve or change. 3. (U) Joint Protection Enterprise Network (JPEN). JPEN is a critical information sharing system and supports essential, reliable, and assured information exchange of Threat and Local Observation Notice (TALON) data, between DoD Elements, enabling decision superiority, battlespace awareness, knowledge, and information management capabilities. JPEN is for the dissemination of TALON and other related FP incident information from the collecting unit to other possibly threatened locations, units, activities or agencies as well as other organizations including analytical centers, such as the Counterintelligence Field Activity (CIFA). JPEN is being fielded to all DoD installations January through June 2005. There is no requirement to purchase hardware or software due to the web-based architecture via the Internet. JPEN Version 2.0 is accessible via any existing NIPRNet or Internet capable computer running Internet Explorer 5.5 or higher, and became available at https://www.jpen.mil on 1 Oct 04.
e. (U) Intelink-S, the Secret-level variant of Intelink, has begun to expand rapidly in scope and reach. As the intelligence support medium for GCCS and law enforcement activities, Intelink-S is expected to become the principal growth area for intelligence products and services. Its customer base will be extraordinarily diverse, eventually encompassing all areas of U.S. Government operations that can benefit from integrated intelligence support and collaboration. a. (U) DoD Directive 5210.56, Use of Deadly Force and the Carrying of Firearms byDoD Personnel Engaged in Law Enforcement and Security Duties, November 1, 2002 (Change 1, January 24, 2002). weapons issued in conjunction with approved exercises or military operations. This appendix provides additional guidance on use of force for personnel performing law enforcement or security functions. 2. (U) Mission. Base Order. a. (U) Concept of Operation. 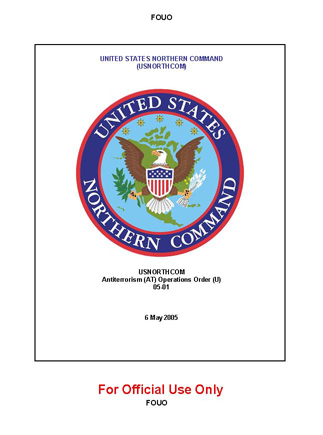 the USNORTHCOM AOR, ref. a. applies. (a) (U) General. Arming policy for law enforcement, security purposes, or personal protection varies by assignment or status of the personnel or unit performing duty in CONUS. 1. (U) Requirements. Before any individual is issued a firearm for law enforcement, security purposes, or personal protection, that individual must be qualified IAW service requirements on assigned individual and/or crew served weapons, as appropriate, and fully trained on the applicable rules for the use of deadly force. a. (U) If assigned or issued individual weapon(s), personnel will conduct battlesight zero (if applicable to that weapon, e.g. M-16) and qualify on the weapon before assignment in the USNORTHCOM AOR. Maintenance on individual weapons will be performed in accordance with service regulations.